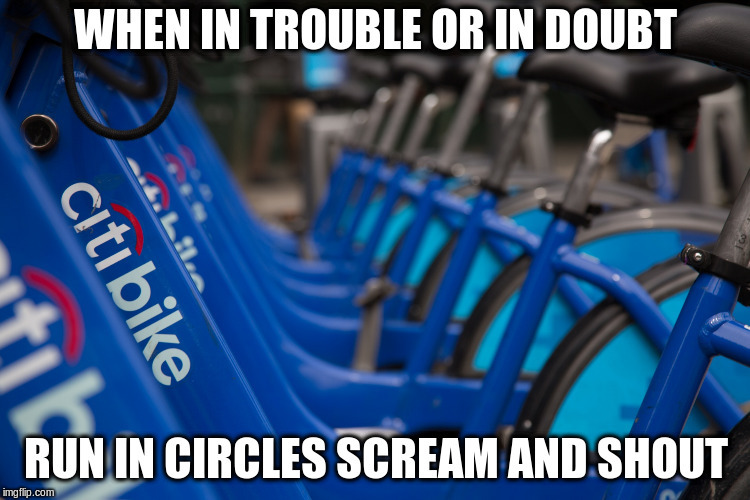 Five years ago, New Yorkers got to participate in the city's first bikeshare experiment, the Citibike, and people were very worried! The UN warned that terrorists would fill rental bikes with explosives and dock them outside the UN building; a former city comptroller thought they'd precipitate a flood of lawsuits against NYC; restauranteurs and people living in expensive brownstones thought they'd lower their property values; drivers complained that they'd lose parking spaces; the New York Post manufactured incidents in which firefighters were hampered by racks of bicycles; and Jared Kushner's New York Observer declared that they were a form of creeping socialism and that if you wanted to ride a bike, you should buy one, not share one. Needless to say, none of this stuff happened. All this is interesting given the current backlash against dockless bikes and scooters -- though of course, these have the distinction of showing up in random, unpredictable places, and have resulted in some real-world, highly publicized negative incidents, notably the mediapathic mountains of ewaste resulting from abandoned bikes. After a huge backlash (and having her alarmism mocked by The Daily Show), Rabinowitz doubled down on her rhetoric in a followup video a week later. She dismissed every potential criticism that was given to her: the fact that there were hundreds of community meetings about the subject before the city went ahead with the program ("Whom are they asking, who are they talking to? "), any positive polls ("It's really quite laughable"), the argument that biking is healthier for NYers ("I doubt it"), and any mention of obstructed bike lanes ("This is a question that can only be answered by the therapist we hope this biker is consulting for a question like that"). She claimed that policemen, like city council members and community leaders, had their hands tied by an "all-powerful bike lobby." Or as she hilariously put it, they were all "terrorized by this thing that really exists." The Vessel: a perfect symbol for the grifter capitalism of New York City's privatized Hudson Yards "neighborhood"
Hudson Yards is a notorious (and spectacularly badly timed) new "luxury housing development" in New York City: a massive, gated, privatized "neighborhood" in Manhattan, a city that has been literally hollowed out by runaway luxury real-estate speculation, to the exclusion of working people and mere millionaires alike. An astounding gigapixel panorama of Paris affords "an eyeful of the Eiffel"